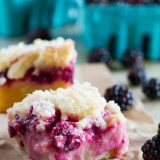 A shortbread base is topped with a creamy blackberry layer and then a streusel top in these Blackberry Pie Bars that you won’t be able to keep your hands out of! Originally posted April 18, 2008 – I know berry season is coming to an end, but I found myself with a half flat of beautiful blackberries last week, and after eating way too many, these Blackberry Pie Bars came to my mind. The recipe calls for frozen berries, so I thought it would be good to see if fresh berries would work as well. And I’m happy to report that they work perfectly!! 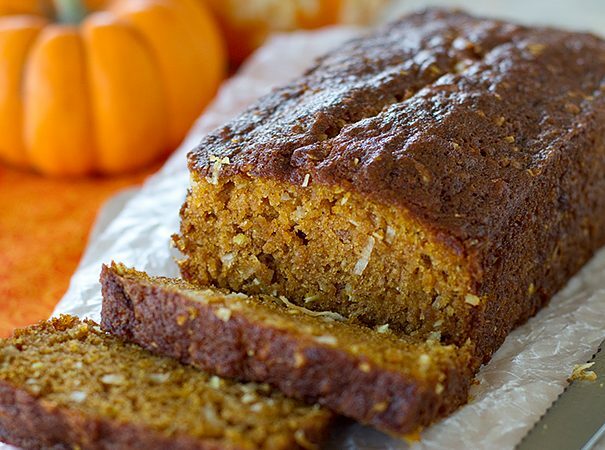 These bars are super ooey and gooey, not to mention sweet and buttery. They are definitely not diet friendly. 🙂 But they are oh, so good. I’ve made a peach version, too, that is amazing in its own right. 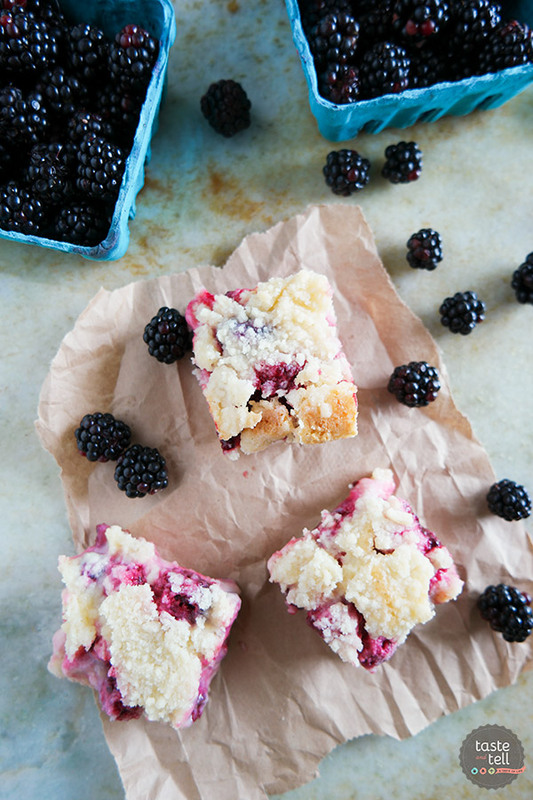 If you can get your hands on some late summer berries, these Blackberry Pie Bars would be the perfect way to finish off the summer! Ever since I saw Emiline’s Wild Blueberries and Cream Tart, I haven’t been able to get it out of my head. So for some reason, when I was reading through my copy of The Pastry Queen, these Blackberry Pie Bars stood out as a substitution for Emiline’s tart, or at least to get over my craving for that tart. I don’t know why they reminded me of one another, because they really aren’t anything alike, but I’m glad that the craving for Emiline’s tart brought me to these bars. These bars are described as an easier way to make pie. No worrying about rolling out a crust. But to me, they didn’t really resemble a pie all that much. The base tasted more like a shortbread base to me. And it was much to thick to be considered anything like a pie, in my opinion. But really – I don’t care what you compare them to, because these we so delicious!! I made them as dessert for the spaghetti dinner I took my in-laws last weekend. Luckily we saved plenty at home for my husband and I, because I couldn’t get enough of them. 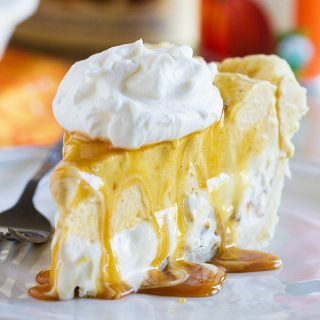 My husband liked them best straight out of the refrigerator with a dollop of whipped cream because the bottom crust was so thick and chewy when they are cold. I preferred them at room temperature. And I ate WAY too many of these. But even now that they are gone, I still find myself wanting more. I almost forgot to add – this was way too much for my food processor -it got way to full and wouldn’t mix completely. I ended up finishing it off by hand with a pastry cutter, which worked just fine! 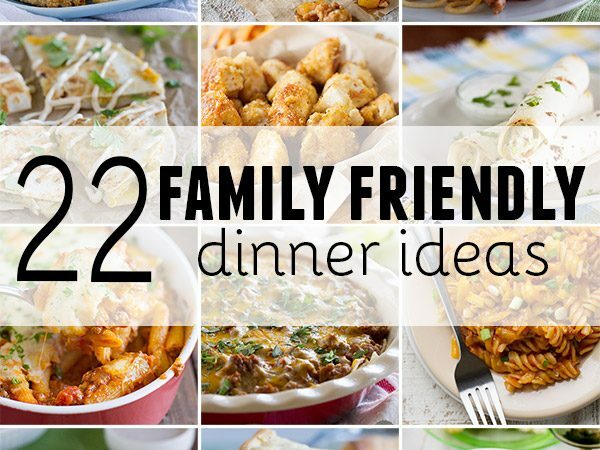 This would be a great recipe to switch up as well. Don’t like blackberries? Use blueberries, or cherries, or a mix of berries. I bet it would even be good with apples. And despite the fact that it doesn’t taste like pie to me, they are much easier to eat and share than a pie is. So they would be perfect for a backyard bbq, or a neighborhood get-together. I can guarantee I’ll be making them again! Preheat the oven to 350ºF. Grease a 9×13-inch baking dish. To make the crust: In a food processor, combine the flour, sugar and salt and pulse to combine. Add the butter and continue to pulse, just until the mixture comes together but is still crumbly. Reserve 1 1/2 cups of the crust for the topping. Press the remaining mixture into the bottom of the prepared baking dish. Bake in the preheated oven for 12-15 minutes, then allow to cool for at least 10 minutes. To make the filling: Whisk together the eggs and the sugar. Stir in the sour cream, flour and salt. Gently fold in the blackberries. Spread the mixture over the crust, and sprinkle the reserved crumbs over the top. Bake for 45-55 minutes, or until the crust is lightly browned. Cool for at least one hour before cutting into bars. After all the chocolate I’ve eaten lately, these look divine! Bookmarking as we speak. Yum. I think I’d still lean towards pie (because, well, I’m a pie kinda girl), but these would be great in a pinch! 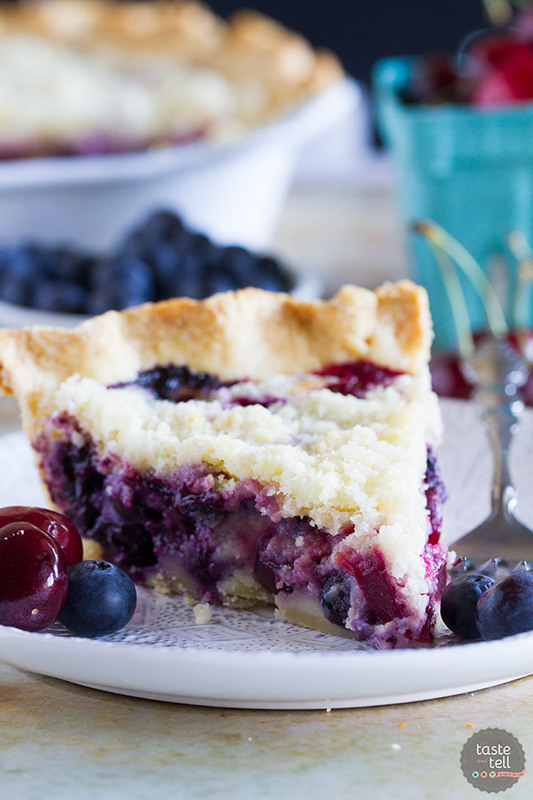 ohhhh, a shortbread crust with a berry filling…bring it on! If the crust tastes like shortbread, by bloke will love it! Thanks Deb! 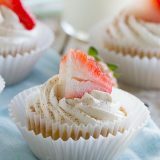 Those sound delicious, I can imagine them with a mix of strawberries and raspberries, yum! these look really good! i think i’ll end up using my pastry cutter or mixing by hand though…my food processor is way to small. Wow, these are some irresistible bars, Deb! I’m glad I can make them by hand, since I only own a mini food processor. 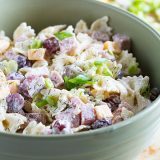 I’m glad I could lead you to this recipe! I think this sounds very tasty…and also very unique. I bet the sour cream was delicious. I once baked a blueberry pie with a can of sweetened condensed milk and it turned out well. I might have to try that again. I just thought of that-it doesn’t really go with your post. Deborah, these look amazing! I can’t wait to try them. Oh, and thanks for letting me know that it was too much for your food processor, good tip. Oooh those sound good! I’d love some blackberries right about now. Ooohhhh, those bars look fantastic! Divine tasting! These look and sound amazing! I can’t wait to try them. Thanks for sharing. I’d use blackberries in these. yum. I don’t really like blackberries by themselves, but they’re awesome baked into stuff. Mmmm! Ooey, gooey and yummy, wish I had one! I love the colors going on! Oh yum! Love the look of these. 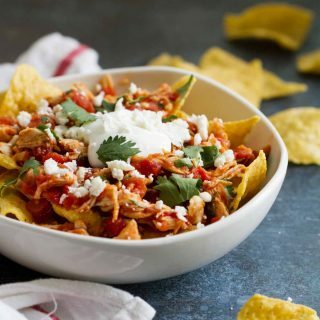 great choice of recipe for Taste and Create! This looks so good. 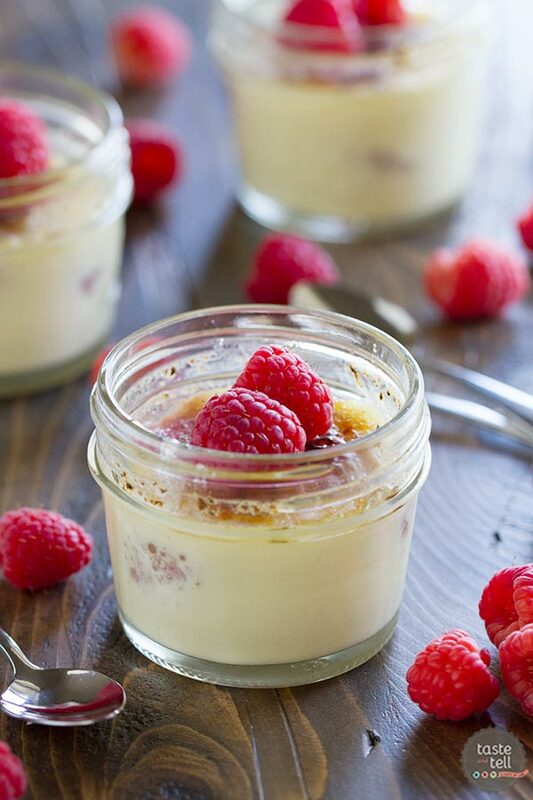 I hardly ever get to make stuff like this because my bf doesn’t like cooked fruit (he’s insane), but I want to make these! Well, they look beautiful. I am picturing myself eating one with coffee…yeah…I think I need one. That is a great book. This one sounds better than pie to me. Love Blackberries! What a great dessert with my favorite berry. These sound totally yummy! I can just taste the tartness of the blackberries. I’ve been thinking of trying the apple pie bars that were in Bon Appetit last month. 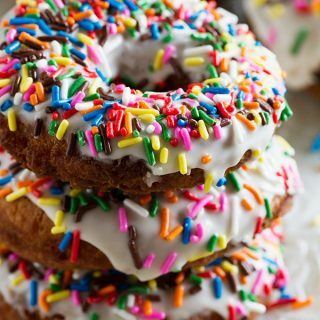 Those look so moist and good. I have not done much with blackberries but I am looking forward for them to be in season. Fantastic, Deborah. This almost looks like portable blackberry cobblers! These look fabulous! What a great way to have your pie without rolling out a piecrust. 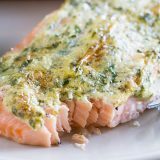 This is definitely a keeper recipe. OMG! those look so good. Every year we go out and pick blackberries to make blackberry jam. 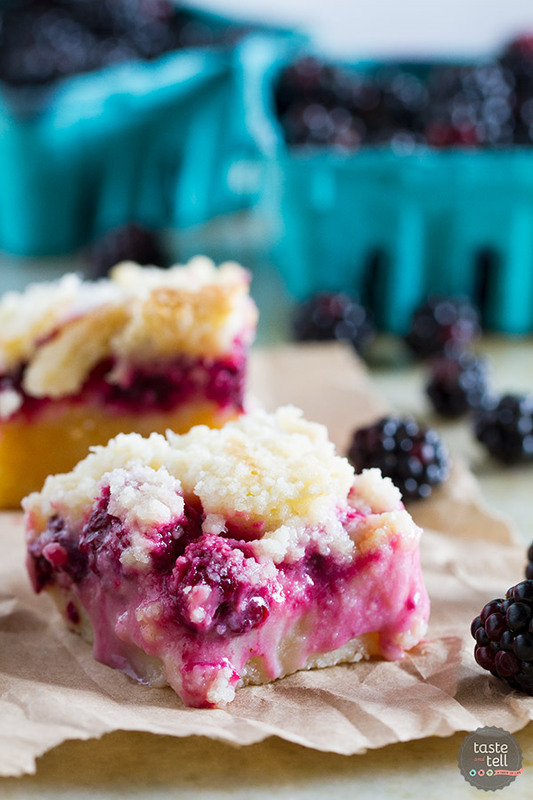 But, I’m saving this recipe to make so blackberry pie bars. They look amazing! I love blackberry anything! Those look fabulous, Deborah! The pie bars are divine.Looks indeed tempting. Deborah I have posted similiar bars with black berries and oats. This bars look great!!!!!!!! these just look Seriously Good OH MY! Ooo looks good and when you said it has a thick shortbread crust, I was even more sold! 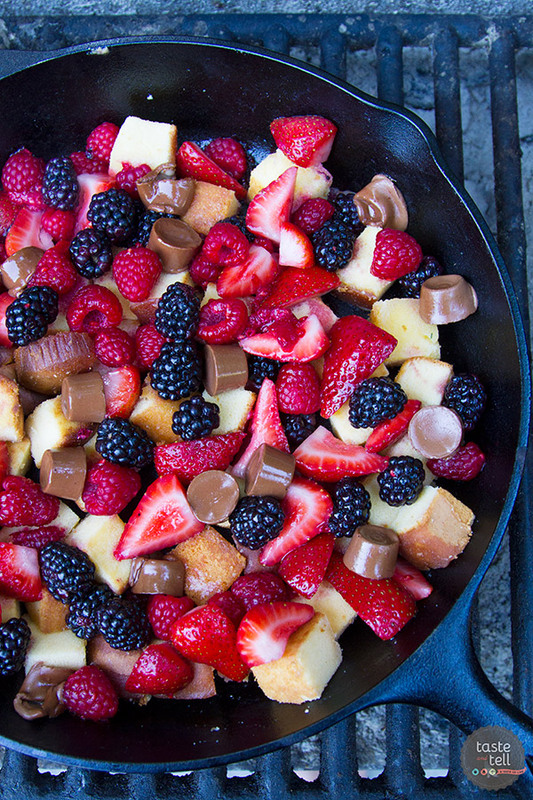 I have lots of berries in my freezer that would be perfect for this. You’re really making me want to buy The Pastry Queen! I’m really attracted by the shortbread taste you describe… and what better way to have the gooey blueberry interior for those of us who are no good at making pie crust! hanks for sharing! i gave these bars a try over the weekend using strawberries and the results were so, so good! everybody loved them. thank-you for sharing this one. 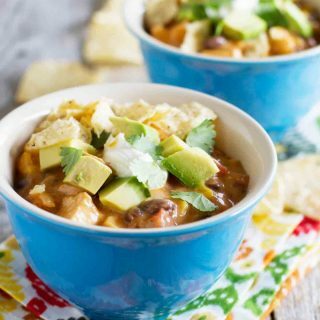 OH KAY…these sound divine and pretty easy to boot! Giving them a go, aren’t frozen berries just a treat?? I have a few gallons of frozen Huckleberry’s in the freezer, gonna have to make these! 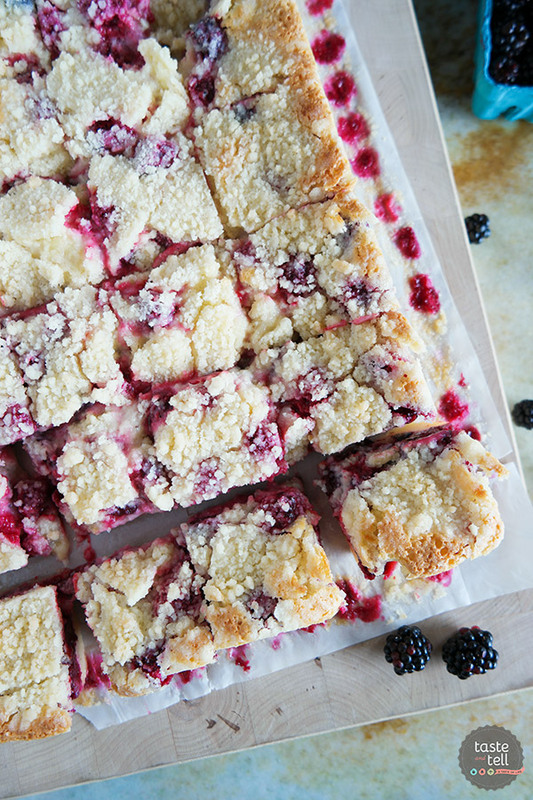 Blackberry pie is one of my favorite things in the universe, and I can’t say no to streusel. I need these NOW! we have a freezer full of blackberries from our garden….this is great! can the bars be frozen for later? I can see why you opted to remake these – they look so perfect. That shortbread…YUM!